If Jesus were to sit down with you right now and have a DTR (Define the Relationship) conversation, how would you respond? 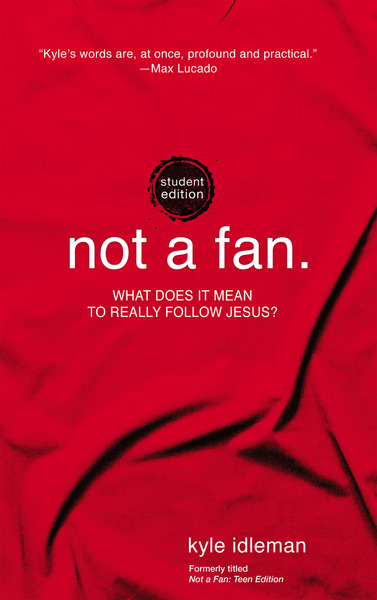 In Not a Fan Student Edition, bestselling author Kyle Idleman challenges you to go beyond fandom into a true follower relationship with Jesus. If someone asked, "Are you a fan of Jesus? ", how would you answer? You attend every movie featuring a certain actor, you know the stats of your sports hero, and you can recite lyrics from your favorite songs. That’s a fan. But are you treating Jesus the same as the other people you admire? The truth is Jesus wants more than the church attendance, occasional prayer, and the ability to recite Scripture—the fan response. He's looking for people who are actually willing to sacrifice in order to follow him. In this student edition of Not a Fan, Kyle Idleman uses humor, personal stories, and biblical truth as he challenges you to look at what it means to call yourself a Christian and follow the radical call Jesus presents. So, will you be a fan, or a follower? Many of today's students know about Jesus—a teacher who traveled around the Jewish countryside giving sermons, healing diseases, and casting out demons, before finally dying on the cross to save humanity. Some may even believe Jesus died for their sins. But for many students, their relationship with Christ is similar to the feelings they have for their favorite band—they know the facts, know the greatest hits, and may have the gear that shows their loyalty. In short, they're fans of Jesus. But is that enough? Similar to the adult book, Not a Fan: Student Edition includes funny stories, personal reflections, and deep, biblical content, calling teenagers to live the way Jesus lived, love the way he loved, pray the way he prayed, and never give up living for the one who gave his all for them.